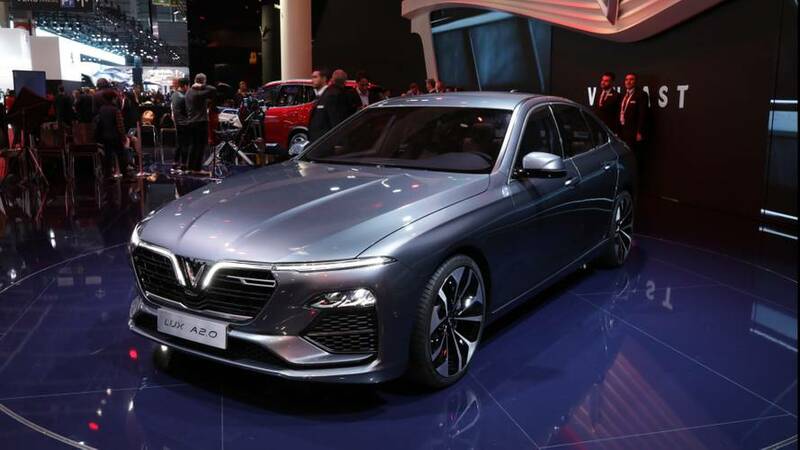 VinFast, a new domestic automaker from Vietnam, made its debut at this year’s Paris Motor Show with two new models – and plans for several more. 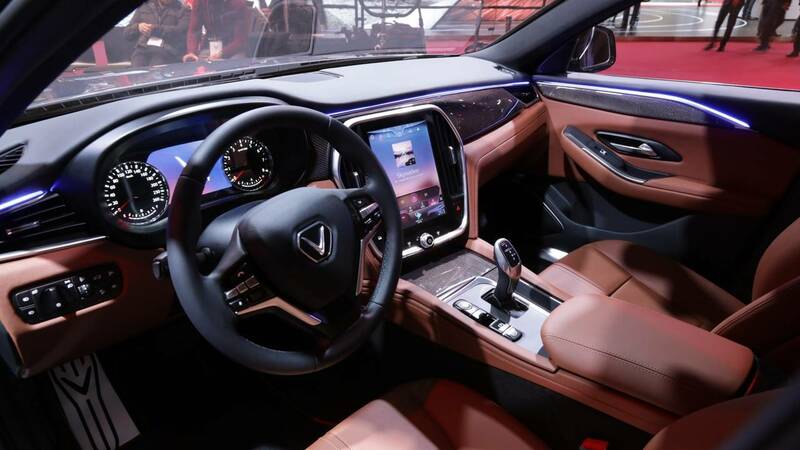 VinFast, a subsidiary of Vietnam’s largest privately-held business Vingroup, is an all-new automaker partnering with established automotive suppliers while attracting some top industry veterans. 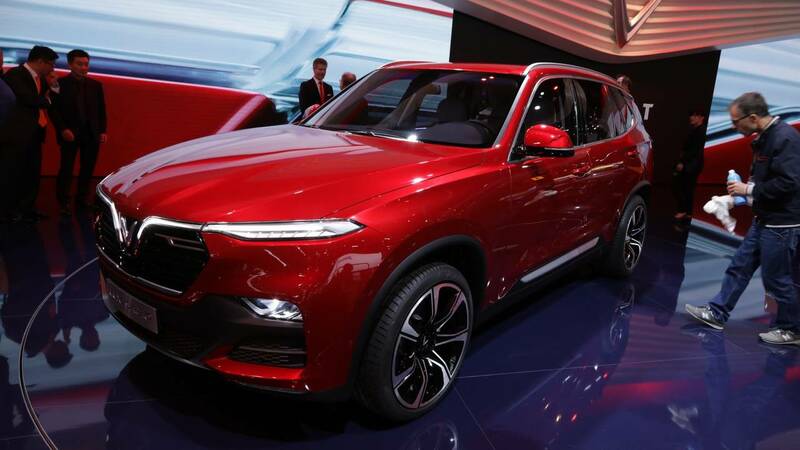 The two models to debut in Paris the LUX A2.0 – sedan – and LUX SA2.0 – SUV – look the way they do thanks to a public vote by the Vietnamese people. The company commissioned sketches from Italdesign Giugiaro, Pininfarina, Torino Design, and Zagato, and then had citizens vote for their favorite. More than 60,000 people participated, with the company taking the most popular sedan and SUV design – both from Italdesign Giugiaro – to Pininfarina for refinements, turning them into the two models we see in Paris. The sedan mimics the long hood and short rear deck of the Alfa Romeo Giulia while the SUV carries design cues that would feel right at home on a new Mazda. Under the hood of each is the same turbocharged 2.0-liter four-cylinder engine, which makes either 174 horsepower (130 kilowatts) and 221 pound-feet (300 Newton-meters) of torque or 227 hp (170 kW) and 258 lb-ft (350 Nm) of torque. Sedan customers can choose between the two power outputs while the SUV will only have the higher output engine available. A ZF eight-speed automatic gearbox routes power from the engine to the rear wheels for both the sedan and SUV. However, all-wheel drive is optional for the SUV thanks to a Borg Warner transfer case. The sedan hits 62 miles per hour (100 kilometers per hour) in 8.9 seconds with the 174-hp engine. That time drops to 7.1 seconds with the 227-hp engine. The SUV hits 62 mph (100 kph) in 8.9 seconds in its rear-wheel-drive configuration while the all-wheel-drive version takes 0.2 seconds more to reach 62 mph (100 kph). This all looks great on paper. We’ve seen several new companies try to wiggle their way into the automotive market, but VinFast feels different. Earlier this year, the company partnered with General Motors. GM agreed to transfer its Vietnamese operations over to VinFast, which agreed to distribute Chevy vehicles in the country for the automaker. The transfer included GM’s Hanoi plant, dealer network, and employee base, according to Reuters. This makes GM VinFast’s preferred automotive technology provider, opening up future product and technology sharing between the companies. This partnership will lead to a new VinFast model – a city car from GM. VinFast has the licensing rights for an all-new, global small car that will be manufactured and sold under the VinFast brand in the country, which will enter production next year at the Hanoi plant. The Vietnamese will unveil an all-new electric car next year with Italdesign Giugiaro penning the design and Germany’s EDAG completing engineering development. Sales are scheduled to start in early 2020. The company also has two agreements signed with Siemens for a fully electric bus. The partnership is for electric motor manufacturing licenses and the supply of components to produce the eBus in Vietnam. The eBus should enter production by the end of 2019. Those plans are under the leadership of chairwoman Le Thi Thu Thuy, who is also the Vice Chairwoman of Vingroup. James DeLuca, who worked with GM for 37 years, is CEO of VinFast Trading and Production while Vice President of Sales is Ms. Lê Thanh Hải, who was the General Sales and Marketing Director at General Motors Vietnam. David Lyon, who was Executive Director of Asia-Pacific Design and has 28 years of automotive design experience, is VinFast’s Director of Design. GM’s former Director of Manufacturing Systems and Support in Germany, Shaun Calvert, is VinFast’s Vice President of Manufacturing. Production for the VinFast LUX A2.0 and LUX SA2.0 should begin next year. VinFast is the first volume automotive manufacturer from Vietnam, and the first ever to participate in a major international motor show. Harnessing Vietnamese spirit, VinFast is developing and manufacturing – in Vietnam – its own range of innovative, world-class vehicles, which will be sold worldwide. It is making its global public debut at the 2018 Mondial Paris Motor Show, with two world premieres – the LUX A2.0 sedan and the LUX SA2.0 SUV. These premium models epitomise the company’s philosophy of ‘Vietnamese – Style – Safety – Creativity – Pioneering’. The design direction of these first two cars was influenced by the Vietnamese people through a public vote. This has enhanced the sense of national pride in these products, which pay homage to the country’s natural beauty. The design development for the production cars was undertaken by legendary design house, Pininfarina, giving the cars Italian design flair and sophistication. VinFast is a proud Vietnamese business with a truly global outlook and ambition, and is working with leading design, engineering and supplier partners to ensure its cars exhibit strong Vietnamese character married with Italian design sophistication and European advanced technologies and quality. VinFast products will meet international standards and customer expectations in terms of premium design, dynamics, in-car features and ownership experience. The business has engaged specialist external expertise and recruited senior executives from some of the industry’s leading automotive companies to ensure it can build a highly successful automotive business from scratch within a remarkably short timescale. The VinFast business is led by senior executives including Chairwoman, Le Thi Thu Thuy, who is also the Vice Chairwoman of Vingroup and has over 22 years of experience in the financial services and real estate industry. She is joined by James DeLuca, CEO of VinFast Trading and Production, who is an experienced automotive leader. He spent 37 years with General Motors, where he was responsible for 171 production facilities in 31 countries. The Vice President of Sales is Ms. Lê Thanh Hải, who has nearly 20 years of experience in the automotive industry and was formerly General Sales and Marketing Director at General Motors Vietnam. David Lyon is VinFast’s Director of Design. He has 28 years of automotive design experience in various roles at General Motors, culminating with a role as Executive Director of Asia-Pacific Design. Shaun Calvert, former General Motors Director of Manufacturing Systems and Support in Germany, is VinFast's Vice President of Manufacturing. Kevin Fisher, Vice President of Engineering at VinFast, has previously held senior technical and innovation roles at General Motors, Tata Technologies and Magna Steyr. Roy Flecknell, Vice President of Planning & Program Management, has over 40 years’ experience in with GM in the UK, Germany, Russia and Asia. VinFast is an exceptional example of the pride, spirit and tenacity of the Vietnamese people. Many countries in South East Asia have prioritised a domestic car industry as a source of great pride, and it has led their elevation to a position of respect for their technical and industrial capabilities on the global stage. VinFast is now pioneering the rapid development of Vietnam’s automotive industry. Until now, Vietnam has not had its own car brand for its people: the industry is made up of imports and local assembly with a low localisation rate; as a result, supporting industries are underdeveloped. VinFast will foster the creation of a new local supply chain and give the Vietnamese people a domestic car brand of which they can be proud. All VinFast cars will be manufactured at an all-new, purpose-built, state-of-the-art 335-hectare plant in Hai Phong, northern Vietnam. It is one of Vietnam’s biggest industrial projects ever, delivering a facility that is among the most advanced automotive production complexes in the world. Deliveries of the LUX A2.0 and LUX SA2.0 will commence in Vietnam from June 2019. These will be followed by further vehicles, including a city car, a battery electric car, and an electric bus – all of which are already in development. Shipments to export markets are planned to begin in 2020, less than a year after domestic sales. As a subsidiary of Vingroup, Vietnam’s largest privately-held business, VinFast has the resources and scalability to fulfil its ambition to become South East Asia’s leading vehicle manufacturer, and a significant new player in the global automotive industry. Vingroup’s brands were founded with a mission to strive ‘for a better life for the Vietnamese people’, and Vingroup wanted to build a proud car brand for the country that was stylish, premium and embodied the Vietnamese spirit, that would appeal beyond its domestic market, to the world. Its vision was to create cars with a strong Vietnamese identity that would represent the country – and be competitive – on the global automotive stage. Vingroup had annual revenues in 2017 of 3.9 billion USD. The group, which celebrates its 25th anniversary this year, is a leader in the Vietnamese construction and real estate sectors, and also has major interests in the country’s education, healthcare, agriculture, tourism and consumer retail sectors. Vietnam’s economy is growing rapidly. Annual GDP per capita has accelerated in recent years to over 6.8% and is forecast to continue at 6.5% p.a. in the coming years. This positive economic outlook creates significantly higher potential for growth in passenger car ownership. Currently, it stands at around 23 cars per 1,000 inhabitants, but estimates suggest that ownership in Vietnam will soon rise to 50 cars per 1,000 inhabitants. For comparison, in Thailand and the US, these numbers stand at 204 per 1,000 and 790 per 1,000, respectively. The current car sales volume in Vietnam is 300,000 units per annum. That is forecast to triple to 900,000 units by 2025. In parallel with the boom in car sales, Vietnam is also investing in significant roadbuilding programmes. Major development works are currently underway, many due for completion by 2020, by which time 21 highways are expected to have been built with a total length of nearly 6,500 km. The proud and energetic styling of VinFast’s first two models were heavily influenced by the new company’s progressive approach to design, and display a world-class design language developed in close partnership with the world-renowned Pininfarina design team in Italy. In order to find a style that reflected the desires of the Vietnamese driver, VinFast did something no car brand has ever done before. First, it commissioned design sketches for a sedan and a SUV from four of the world’s best car design studios – Italdesign Giugiaro, Pininfarina, Torino Design and Zagato. Then in October 2017, it put all 20 designs on its website and asked Vietnamese consumers to vote on which models they liked the most. These Vietnamese consumers were excited to help determine the look of the first cars made expressly for them. With over 60,000 people voting for their favorite designs, the decision was clear; they chose designs for an SUV and a sedan both penned by celebrated Italian design house Italdesign Giugiaro. Since then, VinFast has worked hard with Pininfarina to further develop the cars and deliver the winning designs – designs which are distinctively Vietnamese in character and style and exciting for an international audience, too. One specific highlight of the debutant’s design language is prominent at the front of both its new cars. The chrome ‘V’ emblem at the centre of the grille is confident and distinctive. To the right is a horizontal chrome element that combines with the LED daytime running lights to create an italicised F-motif, representing the second syllable of VinFast, and a unique asymmetric flourish. From the central ‘V’ emblem radiates the bold crease lines that run over the bonnet. From a starting point of exceptional proportions, designers from VinFast and Pininfarina created timeless cars that each feature a long wheelbase and elegant, inspiring styling. Contemporary and timeless, the designs are beautifully balanced, with a sleek profile created by a long bonnet and cab-rearward stance. They exhibit an emotional dynamism through taught and lean surfacing created by carefully sculpted convex and concave forms. Exuding a sense of technological advancement, complex lighting is in layers at the front and in distinctive block-form combination modules at the rear, each incorporating bold LEDs for a very modern style. The sleek sedan has a powerful, dynamic stance and a mixture of curved and concave surfaces that create a sense of elegance and desirable prestige. It is defined by exceptionally balanced and harmonious proportions. The long bonnet visually extends the front of the car, with the sleek minimalistic headlights drawing the eye to the corners, while the roofline stretches rearward to create a cab rearward, sleek elegance. The C-pillar is elongated to visually continue the roofline rearwards, with the rear glass raked at a fast angle. The chrome elements and sleek, modern design give the car a prestigious appeal that enrich the sense of premium. A lower chrome line runs along the length of the body side through to the rear to accentuate the lean proportions. Higher up the bodyside is a sharp, flowing line that enhances the impression of elegance and creates a sense of forward momentum. The aerofoil splitter at the lower edge of the front bumper improves aerodynamic performance – optimised through wind tunnel testing – as air is forced into the intake and expelled ahead of the wheel arches to reduce drag-inducing turbulence around the wheels. The SUV is muscular and robust in appearance, with design elements adding to the strong SUV impression, yet still retaining a lithe, sporty look. At the front, the LUX SA2.0’s imposing bumper guard was developed to be very sculptural and to incorporate cleanly the headlight layout, air intakes and fog lights. The lighting elements create a strong SUV style, vertically stacked from the low-positioned fog lights up to the headlights half-way up, capped by the daytime running lights that flow out from the VinFast logo. As with the LUX A2.0 sedan, the bold front-end design ensures the ‘V’ and ‘F’ of the VinFast brand is a key focal point. Contrasting surfaces and materials subtly enhance the clean, flowing lines, and the sheet metal is juxtaposed with black elements in the front grille to lighten the front end and enhance the sporty character of the SUV. Visual drama in the front is further enhanced by chrome brightwork and highly sculptured gloss black elements that together project a sense of luxury. Meanwhile, the headlights, fog lights and air intakes are presented in a contrasting matte black surround, to heighten the sense of solidity and structure. The new SUV’s aesthetic appeal is strengthened with sculptural, flowing lines that create a sense of forward-leaning aspect, giving the car a sense of dynamic power. This is a seven passenger, three-row SUV that still feels very compact and sporty. The deep body side and shallow glasshouse are carefully proportioned to visually lower the profile and increase the dynamic appearance. The single chrome line across the bottom of the glasshouse sweeps up the C-pillar, accentuating the dynamic lines. Further chrome brightwork around the windows adds to the sense of luxury and creates visual drama, while the striking ‘floating’ roof at the D-pillar adds even more athleticism to the side profile. The inspiration for VinFast’s interiors was Vietnam itself. The design team understood that finding a way to express the Vietnamese personality and broader cultural traits was vital, so they could build a car that would emotionally fulfil the desires and aspirations of Vietnam’s motorists. Clean lines and quality materials make the interior of VinFast models a tranquil and rewarding place to be and reflective of a Vietnamese aesthetic. 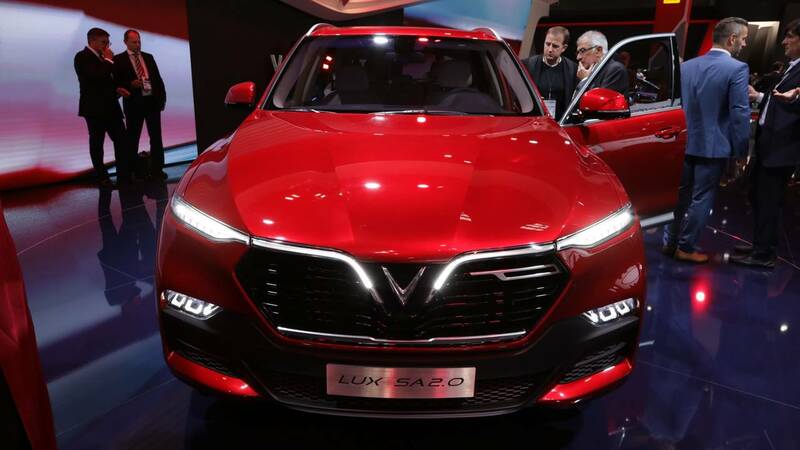 The exterior of the LUX A2.0 sedan and LUX SA2.0 SUV define the character of the cars, and VinFast’s design team have echoed that character in the interior spaces of each model. The focus is on providing uncluttered simplicity and creating a relaxing ambience. VinFast wants this to be a place that drivers feel they can get away from everything: the drive to work and journey home should be the best part of the day. The lines are very clean and simple, and the control surfaces feature very few buttons. For VinFast, creating a clean, cutting-edge user interface was essential. Technology is vital – Vietnam is a smartphone country: more than 80 per cent of the population use smartphones, a higher proportion of the population than in other countries including the USA. And the large 10.4-inch touchscreen dominating the centre console presents a very familiar and welcoming interface for a tech-savvy population. The large configurable touchscreen is the control hub of the car and features simple, intuitive navigation and menus. The design team tasked themselves with creating a fresh new look for the interface without compromising its usability. The goal was to simplify features whenever possible and to make the mood and the feeling of the interface as distinctly Vietnamese as possible. VinFast has created a system to incorporate a more human element for VinFast cars. It uses fewer buttons, prioritizing the hierarchy of functions logically and uses a simple color palette that is easy to read. The result is a UX design that is both simple and elegant. The homepage, for example, has just three icons for top level access, plus a display showing the climate control status in the car. This home menu is contextual with just three large buttons for phone connectivity navigation and audio. The sub-level menus below this — including for the phone and the audio and even the navigation system — owe far more to contemporary smartphone design in terms of both aesthetic and function than perhaps anything yet seen in automotive UX de-sign. Users even swipe down for shortcuts in the same way that you would using an An-droid or Apple phone. As a principal point of interaction between occupant and car, the touchscreen has a color palette to reflect the dramatic use of color in the Vietnamese culture and nature. There are three different themes each based on an iconic Vietnamese landscape, offering the driver a choice of mood and color. Customers can upload their own photos and choose from Vietnam-themed wallpapers for use as a background to the interface, landscapes familiar to Vietnamese customers, including terraced rice fields and Hạ Long Bay. This element of personalization is part of an overall aesthetic designed to connect emotion-ally with local consumers. The subtle presence of technology in the cabin is further complemented by ambient lighting strips integrated into the horizontal interior trim lines across the dash and doors. Designers spent significant time getting the proportions right, with optimised ergonomics and clear lines of sight dictating much of the interior layout. Quality is a primary focus for VinFast throughout the car, and this is especially evident in the selection of materials and the hand-crafted finish. Everything the occupants touch and feel in the car is authentic – if it looks like aluminium it is aluminium; if it looks like wood it is wood. To maintain quality and consistency of material grades and grains, a single supplier – Faurecia – has been appointed to supply all interior parts. Its commitment to achieving the required level of quality and finish is evident in the fact that most surfaces are hand-wrapped and custom-stitched. VinFast is working with world-leading design, engineering and component businesses to create the first mainstream volume cars to be developed and built in Vietnam. The company is pioneering a homegrown car manufacturing industry, with a clear aim to build sophisticated vehicles to internationally-recognised standards of quality, durability, driving dynamics and in-car features. VinFast and its vehicle engineering partners are developing two world-class cars half the usual period taken to develop a new car. To ensure the ambitious programme timing could be achieved without compromising quality, VinFast chose the leading experts in their fields. Over 400 engineers from leading vehicle engineering specialist, Magna Steyr, are developing a new platform for each of VinFast’s inaugural models. The Austrian consultancy is responsible for integrating newly-developed vehicle systems, latest-generation ECU technologies from Bosch, and a new cutting-edge electrical architecture. This extensive new platform engineering programme incorporates patents and know-how licenced from a premium European OEM. The new platforms incorporate extensive use of mixed materials including the latest generation of hot-stamped ultra-high strength steels. Testing is being undertaken using nearly 300 prototype development cars in Vietnam and in Europe. Underpinning both cars will be an ultra-rigid, unitary chassis-body structure. Each structure has been honed to have high natural frequencies, which provide resistance to vibrations and which have been engineered to manage torsion and bending forces to deliver greater control over vehicle dynamics. The suspension on both the new VinFast LUX A2.0 and LUX SA2.0 is independent all round, comprising a double-wishbone front axle with double-pivot lower arms and coil springs, and at the rear a five-joint multi-link axle and a tubular anti-roll bar. The chassis architecture is the most significant element of VinFast's efforts to match European levels of driving quality and refinement, with a keen focus on world-class dynamics and ride compliance. It also provides excellent crash protection, thanks to a strong and rigid passenger cell, and crumple zones at the front and rear. Dual front, side and curtain airbags on all models complement this high level of passive safety, while Active Rollover Mitigation technology is also included. For development of the turbocharged 2.0-litre inline four-cylinder gasoline engine that will power both the LUX A2.0 and LUX SA2.0, VinFast partnered with the Austrian-headquartered AVL. The engine – again, benefitting from licensed patents and know-how – uses a twin-scroll turbocharger, and a newly applied valvetrain. The variable valve-timing system reduces pumping losses to a level that matches that of premium-marque engines. Control mechanisms for the powertrain – which will also feature stop-start technology and a specifically-developed variable valvetrain system – have been developed with Bosch and AVL. VinFast will offer the petrol engine with two power outputs – 130 kW (176 PS) and 170 kW (231 PS). Buyers of the LUX A2.0 sedan will have a choice of outputs, while the LUX SA2.0 SUV will be available only with the higher power output. In each case, the engine will be paired with an eight-speed automatic transmission from specialist ZF, featuring a modified bell housing and crank case. The LUX SA2.0 is also equipped with a torque transfer case from Borg Warner to provide optional four-wheel drive capability as an upgrade over the standard rear-drive set-up. The cars will offer impressive performance. The LUX A2.0 targets acceleration from 0-100 km/h in 8.9 seconds with the 130 kW engine, and in 7.1 seconds for the 170 kW power unit. The LUX SA2.0 SUV with rear-wheel-drive will aim to achieve 0-100 km/h in 8.9 seconds, and just 0.2 seconds slower with all-wheel-drive. The driveability of the new VinFast sedan and SUV has been honed with technology called AVL-DRIVE. This assesses characteristics of a car’s driving experience and can record data to produce a model for the optimum setup, based on feedback from a series of dynamic on-road driving tests. VinFast was able to use AVL-DRIVE to analyse what levels of launch and in-gear responsiveness a large panel of Vietnamese drivers preferred, and then use the results to develop specific characteristics for the production models. VinFast and AVL's assessment programme found that the desires of Vietnamese drivers appear to closely match those of European markets, though with an even firmer preference for a powerful and smooth torque response from the car, without needing to downshift. A similar 'customer clinic' programme was undertaken in conjunction with Magna Steyr to help calibrate data points for the ride and handling set-up. Environmental considerations had a significant influence over the vehicle engineering programme. VinFast will be pioneering sophisticated emissions controls in its home market, employing a three-way catalyst with closed-loop fuel control. This emissions control system is common in European markets but represents a significant step up from the standards currently in Vietnam. VinFast cars will meet Euro 5 emissions standards in a market and region that is currently regulated under Euro 4. While the new cars are being built in Vietnam, and are initially aimed at the domestic market, safety testing is nevertheless being carried out in both Vietnam and Europe. This programme will ensure that VinFast's cars far exceed the current safety standards in Vietnam. The company is targeting a five-star rating for both its sedan and SUV in ASEAN NCAP testing. VinFast’s all-new production complex is one of Vietnam’s largest ever industrial projects and represents an initial investment of $3.5 billion. The new facility will enable a maximum volume of 250,000 units per year. There are plans to invest further in the site in a second phase of development. Alongside the car production facilities, the complex will also be home to the VinFast eScooter manufacturing plant and the business’s operational centre, which was completed in June 2018. Series production of the eScooter will begin in December 2018. VinFast has worked with leading automotive suppliers and consultants to ensure that the production complex will be one of the most advanced vehicle factories in the world. It fully embraces Industry 4.0 systems, with data collection and management systems, interconnected sensors and cloud servers supplied by Siemens and SAP. This technology will help VinFast continuously improve efficiency, productivity and quality in all areas of production. The 50,000 m2 stamping shop contains production processes and technology provided by Schuler of Germany. It is almost fully automated using State-of-the-art servo drive presses ensure the best possible quality for stamped components. The body shop (100,000 m2) will be the most modern in South East Asia, and has been designed and is fitted with technology from FFT, EBZ and Hirotec, and with over 1,200 robots manufactured by ABB. Automation powers all the welding processes, which helps to optimise quality. Adaptive automated spot welds are made by 965 robots, with robotic cells also used for transferring components and applying adhesives. Dimensional measuring systems, laser inspection and testing on the line will ensure exemplary build quality. The primary partner for the paint shop is Durr, which has installed several advanced paint processes and technologies to ensure the paint process meets international environmental standards and delivers a world-class paint finish for VinFast cars. Its special ‘dry technology’ process minimises water use and provides the best possible coating. It will also be one of the leanest water-use paint shops of its kind anywhere in the world, while Durr’s EcoSmart VEC intelligent air management system maximises energy efficiency in the drying process. The paint shop has a capacity of over 800 vehicles per day. The engine shop – the first volume car engine manufacturing facility in Vietnam – has been designed and supplied by industry leading specialists including GROB, Thyssenkrupp, AVL and MAG, with precision machining technology and a hot and cold inspection facility. The 200,000 m2 assembly and finishing line is the result of a partnership with Eisenmann. It has designed and installed a highly automated conveyor infrastructure complete with automated guided vehicles for the final assembly line. The main assembly and finishing processes are highly flexible in allowing multiple car models to be assembled on the line at the same time. Further partnerships are being progressed, in particular with a view to supporting world-class suppliers to locate facilities at the complex’s 700,000 m2 dedicated supplier park. This space will enable VinFast to support the ongoing development of the automotive supply chain in Vietnam, and increase the locally-supplied content to its factory. Several major global tier one suppliers have already committed to the supplier park, including Germany’s ZF Group, Lear Corporation of the USA, and Thailand’s APPICO. Beyond partnerships in technology and production processes, VinFast is also partnering with Eckhert Schulen to train 200 apprentices each year at the purpose-built onsite training centre. With courses in Industrial Mechanics and Mechatronics delivered to German standards, graduates will receive a certificate issued by the German Chamber of Commerce and Industry. Movement of components around the production complex will use lean manufacturing principles, tracked by radio-frequency identification (RFID) technology for just-in-time delivery. When the car production lines are operating at full capacity, the complex will employ approximately 4,000 people. VinFast is Vietnam’s first high volume car company, spearheading the foundation of a transformative automotive industry. Its pioneering ambition is evident in its participation in the 2018 Mondial De L’Auto in Paris, where it unveiled two new premium cars – the LUX A2.0 sedan and the LUX SA2.0 SUV, which will be go into series production in 2019. Vietnam is currently in a 'golden period' of development, with significant inward investment and internal political support for major industrial projects. VinFast aims to take advantage of this economic climate, to exploit the ongoing boom in domestic car sales. Annual volumes are now around 300,000 units, but this is projected to triple to 900,000 per year by 2025. The domestic car manufacturing industry currently servicing this demand is underdeveloped, but it has significant potential. At present, most car sales are of CKD (Completely Knocked Down) kit vehicles, which was necessary for overseas brands to avoid import tariffs on fully-assembled cars. However, in 2018, import taxes on such cars from other ASEAN states will reduce to 0%. More affordable imports could therefore trigger a significant shift in buying behaviour, with a negative knock-on effect for this low-level domestic manufacturing. VinFast seeks to capitalise on the shift towards higher quality cars, by offering a compelling and wholly Vietnamese-built range of vehicles. While the domestic market is the first priority, exports will follow in 2020. Leading global automotive suppliers will have a presence in VinFast’s all-new production complex in Hai Phong. This will encourage the development of a broader domestic automotive supply base, bolstering Vietnamese expertise and capabilities, and increasing the domestic content of VinFast’s cars. VinFast is already looking beyond the cars being launched in Paris. Development is already underway of a small city car in partnership with GM, a fully electric car being developed by EDAG, and a fully electric bus with the support of Siemens. In June 2018, VinFast signed a partnership agreement with General Motors (GM) that included the licensing rights for an all-new, global small car that will be manufactured and sold under the VinFast brand. The new car will enter production in 2019 at a Hanoi plant that VinFast acquired from GM as part of the partnership agreement. Significant investment in the production facility will greatly increase capacity and will grow the manufacturing footprint of VinFast in Vietnam. The agreement also granted VinFast exclusive distribution rights for the Chevrolet brand in Vietnam. GM will become a preferred automotive technology provider to VinFast, opening potential routes for future product sharing and technology transfer. The transfer of the GM Vietnam operation to VinFast – including the Hanoi plant, dealer network and employee base – is expected to be concluded by the end of 2018. Following its investment to bring electric mobility to Vietnam in 2018 with the launch of a range of eScooters, VinFast will unveil an all-new fully electric car in 2019. Design development is being undertaken by renowned Italian design house, Italdesign Giugiaro, while complete engineering development of the car will be led by Germany’s EDAG, one of the world's largest independent engineering service providers. With sales starting in early 2020, it is likely to be the very first electric car on sale in Vietnam. In August 2018, VinFast signed two agreements to cooperate with Siemens for the development of a fully electric bus (eBus). The agreement specifically relates to electric motor manufacturing licences and the supply of components to support the production of the eBus in Vietnam. Together with the production of e-scooters and electric cars, VinFast’s eBus will not only help improve the environment but also contribute to the transformation of the urban public transport system in Vietnam. The agreements enable VinFast to establish a supply chain for the production of zero emissions public transport vehicles in Vietnam, contributing to the transformation and modernisation of the public transport sector in the country. The collaboration with a world-leader brand in this field for the supply of technology and components demonstrates VinFast’s commitment to developing safe, reliable vehicles made in Vietnam with the European quality standards. VinFast plans to begin production of the eBus by the end of 2019. VinFast is committed to Vingroup’s mission to improve the lives of Vietnamese people; it is creating skilled jobs, producing high quality products, contributing to the transition of Vietnam’s economy into high value manufacturing, and will bring investment and export revenues into the country. The construction of the new production facility also provides a significant economic boost to the region, with thousands of jobs created. While a site of this size would normally take around five years to complete, VinFast is set to complete the construction within two years, aided by a workforce of 6,500 people at the peak of the build project. The facility’s buildings and key infrastructure are already completed, and installation of cutting-edge production equipment, tooling, paint and assembly technologies is underway. When the production complex is fully operational, it will employ approximately 4,000 people across the various manufacturing facilities. As VinFast’s manufacturing operation is a completely new kind of undertaking in Vietnam, it has no in-depth automotive manufacturing expertise to call upon in the local market. Because of this, extensive training programmes will rapidly bring employees up to speed on how to assemble a vehicle from scratch, using to-scale models in ‘simulated work environment’ (SWE) conditions to demonstrate the lean manufacturing approach. A technical training centre, which is also located on the VinFast complex, will provide apprenticeships in conjunction with the German Chamber of Commerce and Industry in Vietnam. Students – of which there are anticipated to be 200 every year – will work to achieve a certificate of qualification in AHK standards, giving them the skills and attributes to enable them to enter a higher grade of employment, thereby improving social mobility. Ultimately, the new VinFast business will spearhead the transformation of the Vietnamese automotive industry, developing a first wave of technical, engineering and manufacturing capabilities with help from experienced overseas experts. It will not only pioneer the first end-to-end domestic vehicle manufacturing operation in the country but will also create a skilled automotive labour pool. Sustainability and environmental considerations were also of high priority for VinFast. The initial engineering effort called upon Vietnam’s specialist soft-soil engineering capability, which is world-renowned and of which the country is exceptionally proud. Half of the land on which the production complex is built has been ‘reclaimed’ from the sea, so high-strength metal piles had to be driven 44 metres into the ground to provide the requisite deep foundations. VinFast's production complex also complies with all relevant Vietnamese environmental regulations, and in many cases, the company has paid a premium for low-energy technologies that will reduce its environmental impact to an even lower level. The gas used across the site will be LPG, and high-efficiency LED lighting will be installed throughout the plants. Echoing the values of its parent, VinFast will bolster the industrial development of Vietnam, continue to spearhead the modernisation of the country, and improve the lives of the Vietnamese people. Please note: all data below is provisional and are subject to further testing and development processes. Performance figures are targets and do not represent homologated data.